It has been an action of social disobedience absolutely peaceful and at the same time determined to reach the goal, it began at 11.30 a.m. and finished at 15. The reaction of the police has been disordered and totally out of proportion. While we were negotiating with the officials with the presence of european parliament members and councillors of Rifondazione Comunista and green party to let the disobedients inside the wire of the lager to get out of it, the police has began to charge us. People who were coming out with their hands up and without any mask and also some members of the european Parliament and an officer of the police have been victims of the charges of the police. There have been many contused, some injured, four of them in the head and police have taken the identification documents of 16 people, kept for long inside the detention center: people easily identifiable also without these acts of unjustifiable repression. 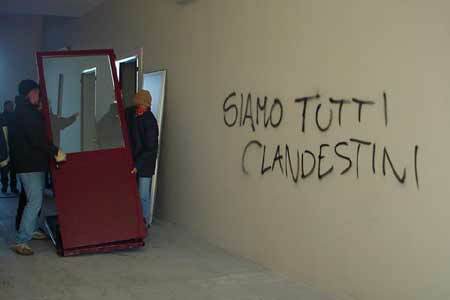 In spite of the umpteenth demonstration, after the massacres of Genoa, of a punitive use of the state violence against unarmed people, the goal of the day has been reached. We have shown the possibility not only to disobey to unjust laws which violate the human dignity and the fundamental values of the italian Constitution, but also to opppose concretely to the new wires and new jails with which the power lead its war against the rights of the moltitudes. We can fight and win the state and the market racism. 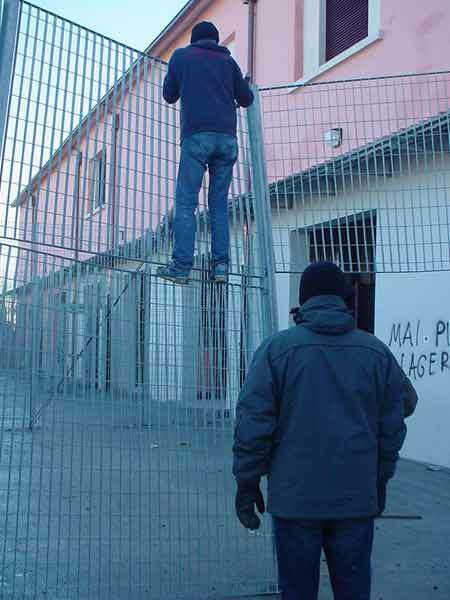 This is only the first step of the campaign of the disobedients by the side of the 200 000 people of the 19th January in Rome and of all the brothers and sisters migrants, to close all the lagers, against the bill Bossi Fini, against racism and for dignity. Bologna, Europe, Planet Earth! - 25 January 2002, first month of the year second of the global war.